The Maytag UKF9001AXX water filter produces cleaner, better tasting drinking and cooking water. The Maytag UKF9001AXX and Amana PuriCleanII filter has an easy design for easy replacement. Maytag PuriClean III UKF9001AXX Refrigerator Ice and Water Filtration Cartridge fits select Amana, Jenn-Air, and Maytag Brands. Remove filter cartridges with a twist and a gentle pull. There is an automatic shut-off that minimizes leaks to keep it clean and simple. To install a new water filter cartridge, simply push it into position and twist. 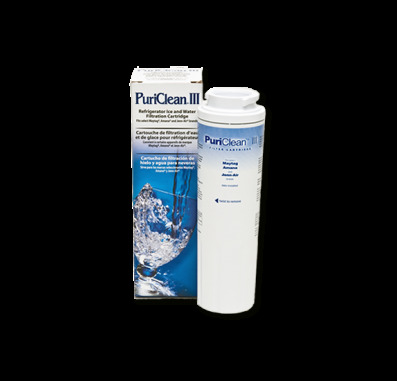 The Maytag PuriCleanIII UKF9001AXX water filter has a filter life of up to 6 months or 100 gallons (378 liters). The Amana Maytag UKF9001AXX is NSF Tested & Certified against Standards 42 & 53.